Tree Plantation to be taken up as a mission like a profession unlike we work to earn something for our family and society. Said Minister Environment & Forest Nabam Rebia today. 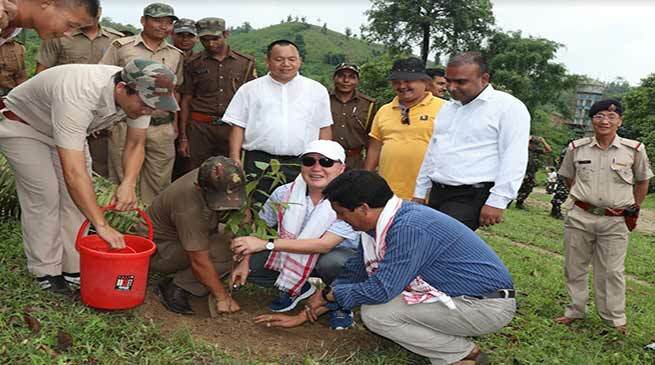 Rebia was addressing the trainees, officials of Police Trainee Centre, family members and local residents on the occasion of mass tree plantation, campaign and awareness on benefits for human being and mother nature as a part of celebration of 69 Vanamahotsava. Rebia said that mother nature have given us everything on this earth and it is our responsibility to protect and preserve it otherwise a time will come our survival will not be possible on the earth in want of oxygen and water. Referring to wanton destruction of forest for settlement and urbanisation Rebia said that around two hundreds of rivers and Nallah in Arunachal have dried up and if such destruction continue may have to face drought like situation even in our state as some of the catchment area of state got dried up and people of those area are getting scarcity of drinking water. We have to protect ourselves by planting more trees and make mass awareness of the advantage of planting trees and affect of burning of forest, killing of wild animals, destruction of flora and fauna and other affect to the mother nature. He said that our state being the highest percentage of forest cover and now the forest cover is also decreasing around 2 % which is a warning for the people of state to get aware. Congratulating the trainees of the Police Trainee Centre Rebia said that you are the future of our state and rising star and agent of security of people and state and appeal them to educate masses about the need of plantation where you live. Principal PTC Surendra Chaudary while motivating the young trainees and locals said that tree/plant are the real agent of life through which we get food and all our needs from tree and plants and few from animals which need to be taken care but we as a human being without thinking of side affect we are continue to destroy and appeal all to plant more tree in school, college and all other place and location wherever possible every year. Banderdewa DFO Neelam Nido while lauding the initiative of the PTC Principal, Banderdewa Self Help Group, former IMC Councillor Tai Tassung and official of the PTCC who planted hundreds of different special of sapling on the occasion and appeal all to save nature and earth through plantation programme. DSP (Training) Dusu Kaling, local leaders, officials and staffs of DFO Bandereda among others were present and take part in plantation programme in PTC campus.